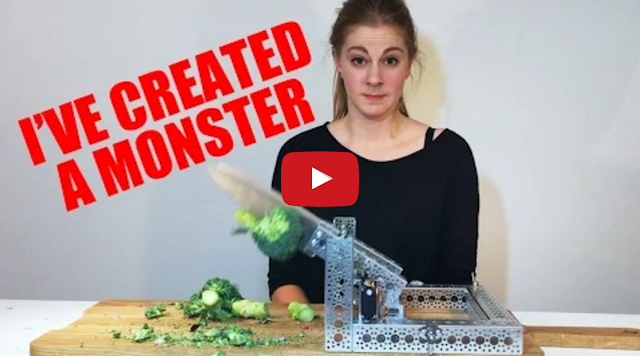 Swedish inventor and electronics enthusiast Simone Giertz, of Breakfast Machine and Wake-Up Machine fame, reveals and demonstrates her latest invention, The Chopping Machine. Simone humorously explains how she made this invention on her blog. "As a lifelong vegetarian, I’ve spent a significant amount of time chopping, mincing and dicing all varieties of vegetables. Eating healthy is boring enough in itself, why does preparing healthy food have to be such a tedium?"